Take a walk from The Don Drewery, learning about the United Brewery Workers and their victory for a city-wide union label, down to the Distillery District and learn about William Gooderham’s paternalistic relationship with his employees. Maybe you’ll then pass through the St. Lawrence Market, stopping for a tasty snack while contemplating the history of workers’ rallies on the site, before finishing up at a plaque at Yonge and King commemorating the failed 1872 Printers’ Strike, the Nine Hours Movement, and the subsequent Trade Unions Act – part of the story of Labour Day! These would be just a few stops on the recently unveiled 19th Century Toronto Labour History Walking Tour. 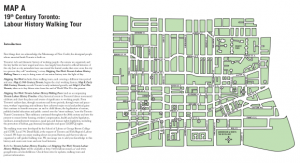 On Wednesday, September 1st, “Mapping Our Work: Toronto Labour History Walking Tours” launched. The Toronto and York Region’s Labour Council commissioned three walking tours for this year’s labour day, written by David Kidd of CUPE Local 79 and the School of Labour at George Brown College (although George Brown himself might not be so impressed, due to his role in the Printers’ Strike). The maps are beautifully illustrated: a large map of the city, with accompanying thumbnails of each site. There are 19 stops on the 19th Century tour, 17 for the Early 20th Century tour, and 17 for the Post-War Toronto walking tour. Together, they are a perfect example of historians interacting with the public, and bringing labour history into an easy-to-understand and easy-to-follow manner. It also reinforces that this is not just history. For example, the map recounts the story of the 1961-62 Royal York Hotel strike – and how it is now a key local of UNITE HERE, engaged as recently as last Friday in labour action throughout the city. 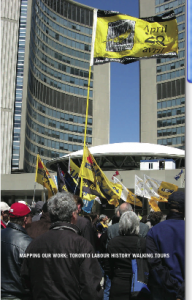 Even the two covers of the map illustrate this continuity: on one side is a picture of the old Chinatown, a poor working-class area in the shadow of Toronto’s (Old) City Hall; on the other side is a large labour rally (the day of mourning for injured workers in 2010) in front of our modern City Hall. Labour is alive. The maps are available for download off the labour council website, although I’d recommend saving them to your hard-drive due to the size and quality of the file. What a great way to celebrate the long weekend! They also help show the changing city. I was struck that the 19th century map is focused on the east end of the city, with Yonge Street forming the western boundary of the map; by the post-war Toronto map, the action largely takes place in the west end of the city. Walking these streets would be a vivid depiction of how the city has changed: from the older buildings of the east end to the newer, post-war squat structures of the west end. The focus is on downtown, which makes sense as the post-war suburbs are generally unwalkable communities with sometimes anemic public transportation. The timing, obviously, couldn’t be better. Labour Day prompts a memory of working-class and labour struggles, and a tour like this helps demonstrate that labour is a truly integral part of Toronto’s history. Every day, thousands of people walk by these important sites of struggle, resistance, and victory: victories that continue to resonate and shape our lives today – from weekends, limits on hours worked, to health and safety legislation. While there is still obviously work to be done, we can build on this past. 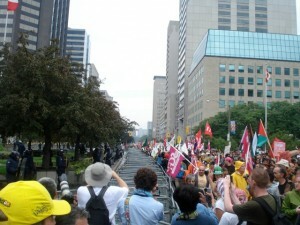 At the recent G20 protests, standing on University Avenue during the Canadian Labour Congress rally, I was amazed at the sheer strength on display and how labour could join together with new social movements, interest groups, and others to demonstrate that these were our streets. It all helps reinforce the motto: Toronto, A Proud Union City. For more information on Labour Day, see the fairly comprehensive wikipedia article or peruse Craig Heron and Steve Penfold’s The Workers’ Festival: A History of Labour Day in Canada (Toronto: University of Toronto Press, 2005). It’s a beautifully bound book, filled with masterful photographs, and makes for a great read – you can check out a sneak preview on Google Books! Thanks to Mike Seaward who gave me hard copies of the walking tour maps, as well as a ‘Toronto: A Proud Union City’ pin.